Earlier in the week my son and I got a big kick out of watching Zachary reach over the back of the sofa and paw Beau on the nose. It was funny not because Zachary was hitting Beau (although he was – albeit gently) but because Beau so calmly sat there while Zachary swatted at him like some overgrown cat going after a toy on a string. 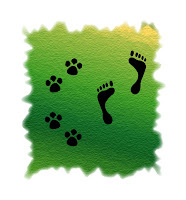 One step backward by Beau, and Zachary would not have been able to reach him. But Beau never moved and Zachary methodically leaned over the sofa and pawed him over and over again. Weird. Funny, yes, but weird. And it has nothing to do with the Photo of the Week except that watching Zachary lean over the back of the sofa gave me an idea for the location of this week’s shot. 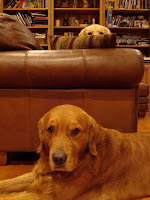 So today, with the week fast drawing to a close, I grabbed my camera, some cookies, and a couple of Golden Retrievers who happened to be lurking about, and headed for the family room. What I wanted was a shot of Zachary looking over the arm of the sofa down to Beau, who would be lying on the ground below. So I lured Beau into position, put him in a down stay, and basically didn’t have to do a darn thing with him after that except feed him the occasional cookie. You’ve gotta love a solid stay. With Beau in position, I called Zachary up onto the sofa and then lured him to the arm. He was a natural, offering me several really cute shots in the span of just a few minutes. He also held a pose really well, and both managed to hold it even when I brought out the squeaker to get their attention. As to why this post is called “Pavlov’s Dogs”, well, I’ll leave that one for you to figure out on your own. I hate the word "heeling". Merriam-Webster defines it as "to move along at someone's heels"
Hard to find fault with that, I suppose, yet I do. When I'm walking with my hubby, I certainly don't tell him to "heel" and he'd better not tell me to - at least, not if he wants anything remotely resembling an edible dinner for the rest of the week. We walk side-by-side because we want to, because it's really hard to hold a conversation in any other formation, and because that's the way companionable adults walk. When my son was little I also expected him to walk next to me, and I held his hand to make sure he was successful. I wanted him beside me so I knew where he was and to reduce the likelihood of him getting into harm or harm getting to him. The word "heel" never came to mind. If you've read my past posts, you may have noted my subtle (and sometimes not-so-subtle) objection to some of the common terminology used with dogs. For example, I try very hard not to use the word "command". I don't command my son to do things - I either "ask" him or I "tell" him. I figure if those words are good enough for my son, they are good enough for my dogs. Back to "heeling", and more specifically, what does it have to do with Dance? 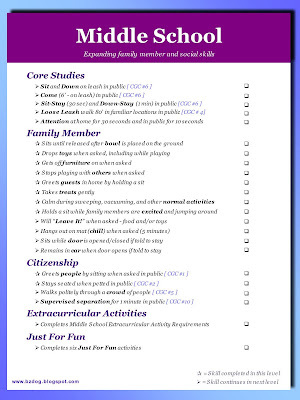 Remember Extracurricular Activities? They are suppose to broaden my boys' (the furry ones) experiences and give them a taste of actual applications when possible. For better or worse, "heeling" is a huge part of many dog activities that I might consider in the future - Obedience, Rally, and Freestyle all jumping to mind but I'm sure there are others. Verbiage dislike aside, I simply can't avoid the activity. But that doesn't mean I can't have fun with it. What is heeling? What is it really? It is moving in sync with someone else. That's it. I move, you move. I stop, you stop. I turn, you turn. And THAT is how we finally get to Dance. What is traditional dance? Moving in sync with someone else. I move, you move. I stop, you stop. I turn, you turn. Sometimes we move in the same direction (Waltzing) and sometimes we don't (Square Dancing) but it all involves synchronized movement. This connection between heeling and dancing certainly isn't anything I invented, but I personally made the connection a few years ago when Beau was doing Rally. At one of the last trials we were at, the judge had put together a lovely course that was full of curves and turns. It was somewhere amidst that sea of signs and cones that I realized Beau and I were, in fact, dancing. He was focused on me and I on him, and we moved together as one. One has to understand Beau's total indifference to Rally to truly get the magic of that moment. For whatever reason, this one particular course had moved him on a deeper level. And as he looked up at me while we weaved and turned our way across the floor, for one brief moment, we sparkled. And that is the magic of Dance. It’s been a while since I’ve worked on “Chill” - what Sue Ailsby calls “Go To Mat”. Given the easy layout of our house and the dogs’ respect for the rickety baby-gate, we just don’t have the need. Alas, Sue didn’t know that when she wrote her Levels, and therefore we are stuck working on Go To Mat in Level Three. And so, with January fast coming to a close, it was time to brush the behavior off and see how it looked. 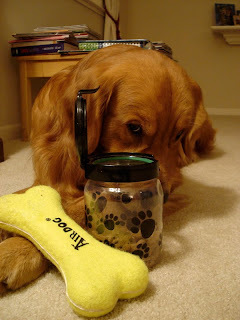 Out came the cookies, the clicker, the rug, the video camera, and the dogs. Yes, I said dogs. Plural. Sue never said I couldn’t have some fun with this. Teaching two at a time (henceforth called Team Teaching) has its challenges. For one thing, Zachary is a clicker maniac and will try a thousand things to make a click happen. Zachary can reproduce a behavior six times in the time it takes Beau to do it once. Well, I think you get the idea. All is not lost, however, as Zachary would do paw stands and bark the national anthem for a single treat the size of a pea, while Beau might deign to sit and down but then expects a handful. As Beau just happened to have stepped onto the rug, I starting things off with a click and a treat in his direction in hopes he would be inspired. Zachary immediately got on the rug and lay down. Yeah Zachary! A few more clicks for Beau (mostly for lucky paw placement) and the game was on. Tossing the cookies off the rug to reset the game. Tossing the cookies in opposite corners of the kitchen to avoid poaching. Tossing Zachary’s cookies out of the kitchen if I needed an extra moment or two to work with Beau. I also learned a few things that I think gives added worth to Team Teaching. Beau is more likely to stay “in the game” when Zachary is there. It actually seems to keep him from getting overly frustrated. I think Beau has a calming influence on Zachary. I didn’t see Zachary throwing behaviors at me right and left when I withheld the click at the end to get an extra heartbeat of duration. Three minutes (and a bowl full of cookies) goes really fast when you are working two dogs at once! The dogs (and in particular Beau) seemed much more focused on my face instead of my hands. I’m guessing it was so they could tell who was going to get the cookie when I clicked. The dogs showed a whole lot of respect for each other’s cookies. I half-expected Zachary to make a try for Beau’s cookies at some point, but that never happened. Perhaps the cookies were flowing freely enough Zachary didn’t feel the need. I would definitely not try this if your dogs have “issues” with food or each other!!! I really enjoyed this exercise, and barring a true (aggressive) disaster at some point I foresee me doing it much more often – probably not for brand new behaviors, but certainly for reinforcing, refreshing, and improving duration of known ones. I had just a few minutes of free time earlier yesterday evening, and as it had been an otherwise dismal week progressing on my Canine Curriculum, I decided to grab the gloves and do some quick shaping for Level Four Retrieve (Yes, I admit it, I was cramming before I had to write the weekly progress report.) With no time to teach the dogs individually, I figured I would see what would happen if I taught them together. Isn't that what the dolphin trainers do? I grabbed two gloves, my clicker, and a bowl full of treats. Zachary immediately ran out of the room. That’s not quite as surprising as it might sound since Beau always goes first and Zachary knows that. Zachary earns a bunch "free" treats for this behavior, and considers it a good deal. Zachary immediately dove for a glove, grabbed it, dropped it again, and then looked up at me. A click for Zachary plus a cookie. Yeah Zachary! Beau stared at me expectantly, but didn't budge. Zachary grabbed his glove and repeated the behavior. A click for Zachary, plus another cookie. This was fun! Beau started at me expectantly, but didn't budge. At this point I felt sorry for the big dog and nudged the other glove with my toe. Obviously confused, Beau sort of, kind of, moved his nose in the general direction of his glove. Good enough for me. An enthusiastic click and we had a party. Meanwhile, Zachary had picked up his glove a half-dozen times, given it some killing shakes, dropped it at my feet, picked it back up again, and pranced about the room. I figured the click for Beau would count, and tossed some cookies at Zachary. Beau (done Hoovering up his cookies) was staring at me expectantly. Zachary ran to his glove, grabbed it, tossed it up in the air, picked it up again, and tried to give it to me. Zachary was adorable. Zachary got a click and some cookies. Zachary repeated his glove antics, and got more cookies. 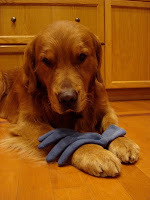 Somewhere, in the deep dark recesses of the canine mind, a light bulb flickered on and Beau picked up his glove. Woo-Hoo! A big click! And cookies poured down from on high. Did I mention that Zachary was now holding his glove and flipping his head up and down as he spun in a circle? Didn’t I just click for Beau? It tossed some more cookies toward Zachary. At this point, both dogs were in the game. I concentrated on clicking and treating each dog, individually, specifically, alternately if possible, favoring glove holding behavior. All too soon, my time window closed and I had to put cookies and clicker away. It was a fascinating experiment, and one I intend to repeat. The setup technically favors Zachary (the better shaper) but as Zachary happy works for one or two cookies while Beau expects lots of jackpots, I think cookie parity can be maintained. I suppose this means cramming is a good idea after all, but don’t tell my son I said that! 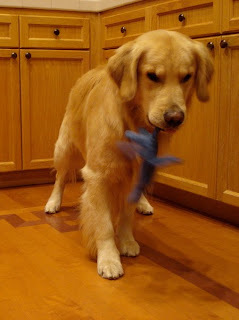 This week I worked on Retrieve, Training Level Four, holding an object for a few seconds. Day One: I broke out a pair of new cotton garden gloves and took a seat. 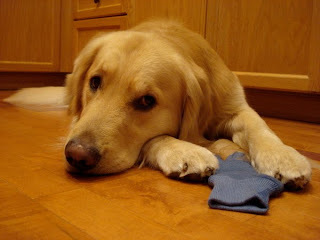 Beau is good at touching things and right off the bat he was whacking at my limp cotton garden glove with his nose. This was obviously too easy. 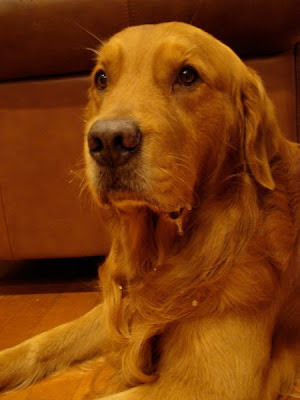 So, having not read the instructions (bad teacher - no biscuit) I held the glove and ask Beau to “take it”, which he did… in his slobbery mouth… my thin cotton gardening glove… in his slobbery mouth. Zachary also took the glove without issue. He tossed it into the air, gave it a few killing shakes, and then tried to give it back. Gee… uh… thanks. 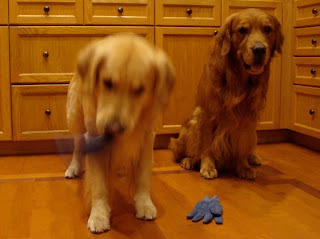 We repeated that a few times and soon the glove was wet beyond belief. Fresh out dogs and dry gloves, I decided to call it a night. Day Two: This time I actually read the instructions and discovered I wasn’t supposed to let go of the object (glove) at all. My bad. 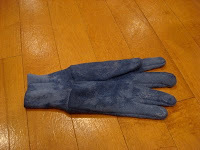 Out came Beau, out came a (now dry) glove, and we began anew with me firmly grasping the glove. Did you know... that holding a floppy thin cotton gardening glove at the same time as a wet-flewed dog holds the same floppy thin cotton gardening glove results in your hand getting really, really wet? Out came the plastic cooking spoon. There is plenty of room for me to hold said spoon in relative safety while Beau touched and slobbered to his big heart’s content. Perfect. As Beau is a bit sensitive with regards to shaping, all we worked on that night was touching the spoon. Beau touched it a lot, he got a lot of cookies, and a good time was had by all. Out came Zachary. Zachary also had no trouble touching the spoon. Zachary has no trouble with shaping, so after a dozen or so easy touches I withheld the click to see if I could get a bigger touch. That is what the instructions said to do. Zachary was supposed to touch the spoon. I was supposed to withhold the click. Then the instructions said Zachary was supposed to think something like, “Hey, stupid, I touched your dumb spoon, weren’t you paying attention?” Then he was supposed to give a bigger touch, so I could click and shower him with cookies. This time, it was Zachary who hadn’t read the instructions. I pointed to the spoon and he reluctantly nosed it. I click enthusiastically and the spell was broken. I clicked a couple more times for touching the spoon then decided to quit before anything else got broken. Moving right along… Loose Leash walking. 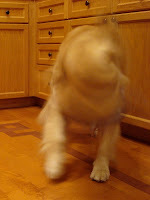 Alas, it was raining that night so I decided to practice Synchronized Walking (aka heeling) about the Kitchen, instead. I grabbed some more treats, lured Zachary to my left side, and briskly stepped forward. Do you remember, not so very long ago, when I was bemoaning the difficulty in getting Zachary to look at me for Ten Seconds? OK, I’ll admit it. I had a bit of fun with this one. Fine – a lot of fun. But isn’t that what life is all about? 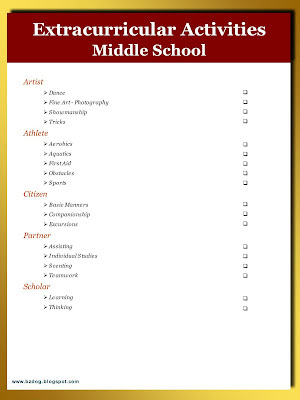 I think the Extracurricular Activities (or Electives) found in Middle School are also about having fun, while at the same time experimenting with life skills. That’s fun plus the opportunity to try on a variety of hats, so as to separate out the ones that fit from the ones that don’t. What a deal! The same opportunity should exist for my dogs. And yet I’m finding their education to be sadly lacking in that sort of planned fun and variety. Yes, I dutifully follow Sue Ailsby’s program (and highly recommend it!) and I work through the rest of my Canine Curriculum (which I have been slowly uploading here) but there is a certain sameness to it all, and I’m not really sure how much fun it is for my boys. Well, except for the cookies part. They definitely like the cookies part. … and Zachary sure seemed to have fun dancing, although that was hardly the point of the exercise. Therefore, I think it’s way past time to build some fun into my Curriculum. Now I’m not promising that my boys and I will actually have fun doing the things I’m thinking about here. In fact, some of these might be total disasters (and I’m sure you’ll hear about those) but at least they will be different from the usual sits and downs and stays in the middle of the kitchen floor. Enough of the preamble, time to get down to business. I decided to model my Elective Classes after the Cub Scout handbook. My son was a Cub Scout (now a Life Scout) and we had a great time going through his handbook. Activities were sometimes educational, sometimes silly, usually fun, and could be accomplished without an undo amount of skill, time, expense, or effort. You could just flip open the book, pick something new, and have at it. And that is the goal for my boys. 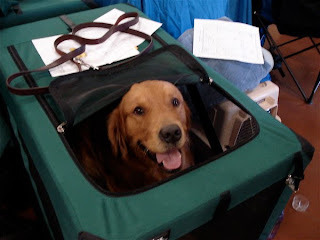 I considered simply having my Electives follow AKC titling events and other well known activities – so I would have had an Obedience, Rally, Freestyle, etc. Class - but after giving it some thought, I realized the requisite basics would result in a lot of overlap (ie. some form of heeling is common to all of the above) and that would be tedious and boring. Boring is definitely not fun. 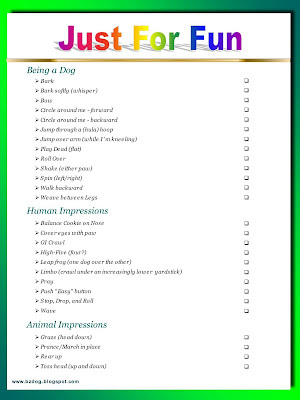 So back to first principles I went, taking every dog activity I could think of that my boys and I could do (Obedience, Hiking, Therapy Dog…) and then listing the core elements as I understood them (uh oh.) 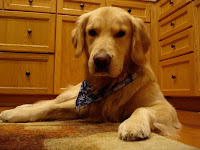 Activities that would make no sense to my Golden Retrievers (like Protection or Earth Dog) or would not work for me (a purebred Couch Potato) are poorly represented, if at all. Shrugging off the obvious flaws in my method (and knowing that as Dean of BZ Dogs’ Canine Curriculum, I could always amend things later) I then tried to group the elements into broader categories with fun titles. In the end, it was those titles that set me free. They spawned ideas for the (hopefully) fun things that could be done within them, without the constraints of the activities they originated from. That certainly seemed in keeping with my original Cub Scout Handbook analogy. That’s pretty much as far as I’ve gotten so far. 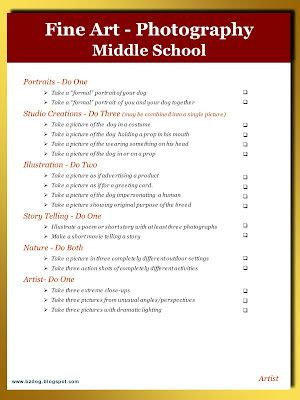 My ultimate goal is to come up with a dozen or so simple activities for each Elective, with some being required and others not. Again, most should be brief, fun, and frivolous and not a serious or studied approach to any one thing, and they all must be something that I want to do! 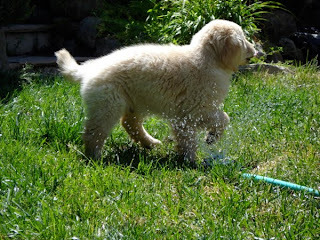 As an example, Aquatics might include playing in a sprinkler, jumping over a stream of water from a hose, splashing through puddles to retrieve a toy, bobbin for toys/food in a wading pool, as well as actually swimming in a body of water or going in after a toy. When possible, elements from Sue Ailsby’s Training Levels and/or my own Curriculum will be folded in, such as requiring a sit before running through the sprinklers after a ball. Think of it as Applied Learning. But in the end, this is only Middle School. I’m not shooting for Higher Education or extensive indoctrination. After all, if my boys aren’t willing to splash in puddles for toys then there’s little point in trying to make them retrieve dead things from a half-frozen pond. And here’s a possible example for the requirements for one of those Elective Classes. Again, this is still very much under development, and suggestions are always appreciated! The problem is, I never knew what to do with all those pictures… at least not until I started this blog. All of a sudden, there I was, faced with a long expanse of boring white, splattered heavily with black text. Perfect! At long last a chance to use those colored pixels. Many of the photo’s you’ve seen so far were drawn from my archives. Many, but not all. A precious few have been purpose made – like the witch’s hat shot and the one where Zachary was behind the tray, both shot specifically for the Quizzes post. In fact, I now want to create a staged photo every week or so. I know, I know… I know what you are thinking – yet another excuse to not be training Fronts and Finishes. And you would be right, of course. But at least let me plead my case. And then add a funny hat? … or a pen that shouldn’t be eaten? … or a plate of cookies that can’t be touched? Creating a staged picture with my boys is a bit art, a bit science, some last minute training, and a whole lot of luck. For example: the witch’s hat shot. The hat was a Halloween leftover, with a moderately stiff brim, but a crown (peak) that was totally limp. If you have it on a nice round Homo sapiens head then it stood up proud. On an oval dog head? It went limp faster than a wet wicked witch. So the first problem to solve was a technical one… and it was done using a rolled up newspaper crammed into the crown. The second problem was which dog it would look best on. That was solved really fast as Zachary didn’t want anything to do with a strange contraption on his head! 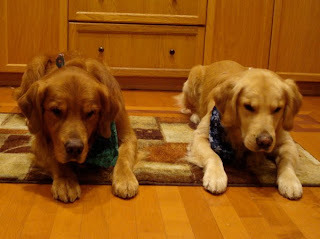 In fact, it was all I could do to get Zachary to stay next to Beau while Beau was wearing it. When I finally looked back at him, his head was totally swallowed up except for a bit of black nose poking out the front. 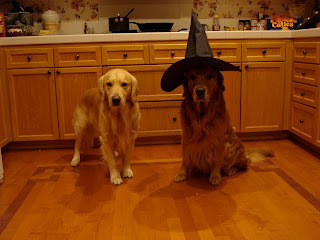 Maybe that was what was spooking Zachary – the dog eating hat! Poor Beau was totally unable to see anything at that point and yet he didn’t move a paw. What a good dog! Then again, perhaps he felt less embarrassed that way, thinking no one would recognize him. In the end I got my shot. I don’t think there was much art in that one, but it was a great learning experience. I learned that Zachary doesn’t like things on his head. I learned Beau is much more patient than I have any right to expect him to be. And I learned that things that look good on humans might not look so good on dogs. 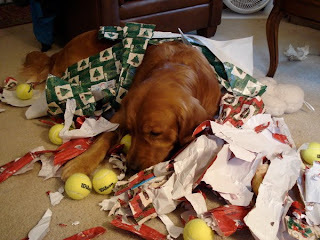 If you want to know what the dogs learned, you’ll have to ask them yourself. They still aren’t speaking to me. Wow - time sure does fly. My little bundle of fur is fast approaching two years old and his Uncle is now six! I think it’s fair to say that both passed Primary School, and if they never learned another thing they would still be fine family dogs. 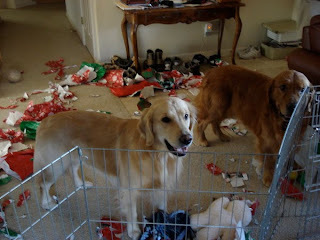 So, having mastered the fine art of not destroying my home (usually), each other, or me in Primary School – what’s next? Why, Middle School of course. Of all my years in school (I am a college grad) I disliked Middle School/Junior High the most. It was an awkward time, where I found myself too old to be a child yet too young to be anything else. Thinking about my youngest charge, I find eerie similarities. My Canine Primary School graduate’s behavior in the confines of a carefully managed home has reached a level where it is easy to be lured into thinking he is more skilled than he actually is. He knows how to sit and down and stay, but is not ready to do so with serious distractions – and let’s face it, if it wasn’t for distractions I really wouldn’t need him to be sitting, lying down, or staying! Physically capable of doing many things, he lacks the control (by me or himself) to be expected to do them reliably or seriously. My goal for Middle School is teach my student this all-important self-control. 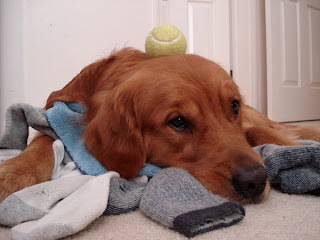 Stay means stay, even if a roast beast falls at your feet (or mom puts a tennis ball on your head!) Same goes for sit and down. As before, all work and no play makes everyone dull. Through Field Trips and Extracurricular Activities, I hope to enrich my dogs’ lives with new experiences and the opportunity to try new things. If all goes well, my Middle School graduate will move on to Secondary School, where I hope he learns to willingly offer appropriate behaviors at the appropriate times. No more nagging from me, yeah! If he makes it that far, then where to go next is only a matter of our mutual interests. Rally, Agility, Freestyle – so many opportunities! But I am getting way ahead of myself. For now, I will endeavor to make our journey together as enjoyable and rewarding as possible. As always, clicking on the image takes you to something more readable. 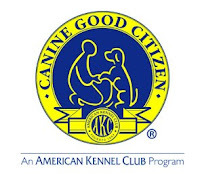 I am hoping Zachary earns his AKC Canine Good Citizen (CGC) Certificate this year, and thus you will find us studying for it quite a bit during the early months of this year. For those not familiar with the CGC, it contains the following ten items. I have no doubt that for many dogs, the above is a piece of cake. 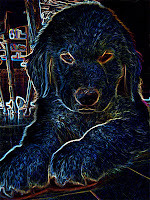 I’m sure there are dogs who can walk into the test, obediently at their beloved owner’s side, and breeze right through all items without ever having studied at all. I do not own one of those dogs. It was a labor of love (or possibly insanity) on my part to get Beau’s CGC, requiring two full sets of classes (six weeks of Sundays, each) totaling $256. No, he didn’t pass the first time. 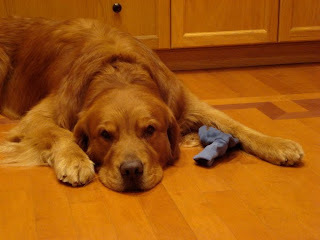 Let’s just say that ignoring people was… hard… for my immature, exuberant, and overly friendly two-year old Golden boy. I have a clear memory of suggesting to the instructor that she should stare at the wall - the one on her right as we past on her left - and to not even think of smiling, in hopes that for once he wouldn’t try to leap up and kiss her as we walked by. It’s a good thing I kept an iron grip on my 80lb rocket. 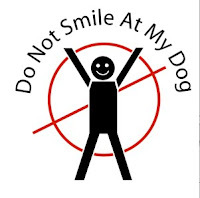 I remember wondering, right before the first time we took the test, if I should have worn a “Do Not Smile At My Dog” T-Shirt as a not-so-subliminal message (warning?) to the poor unsuspecting tester. Beau held it together until the grooming part (all the way to Test #3 of 10) then rolled over for a belly rub as soon as the “friendly stranger” tried to pick up his paws. We aren’t talking a partial roll or a fearful roll. No, this was an all-four-paws-in-the-air-wiggling-with-pure-delight sort of roll, showing all the parts that God gave him while he was at it. He has no pride whatsoever. I am sure there were many other priceless memories formed doing those first six weeks, which are now thankfully lost in the same black hole where childbirth memories go. His second set of six classes was unremarkable, as was his second test (for the most part) save the final moment when I realized he had actually passed. At least he didn’t keep me in suspense as to whether he would pass or not. That was Test #1 of 10. 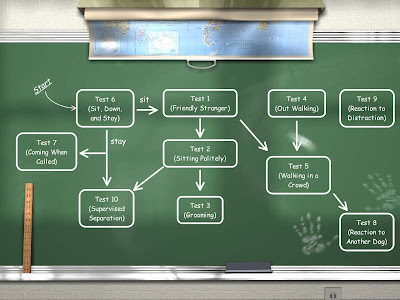 It’s now a year later, and the time has come once again to seriously consider the CGC test. I even drew up a plan this time to help us prepare. I’m thinking that the only real problem is going to be #10 (he’s a big momma’s boy) but anything with a dog (#8) or another human (#1-3, 5) is going to trip his friendly trigger. Then there’s his tendency to bark at strange sounds (#9), follow his nose (#4), and anticipate commands (#6-7). They say those forgotten memories of childbirth pain return when you are having your second child. Given what I do remember about CGC classes and tests, I can hardly wait to rediscover the gems I have forgotten. So I uploaded last month's Just For Fun item last night. Curious? Click here. As all work and no play makes dogs just as dull as people, these are included in my Canine Curriculum to bring zest amidst a sea of boring sits and stays. By all means, feel free to offer further suggestions! 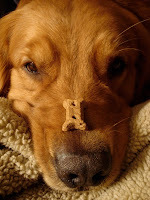 From a canine point of view, is there really a difference between learning to balance a cookie on your nose vs. doing a perfect Front? In theory, there shouldn't be, but I bet there is. My mood is much lighter and the atmosphere much less tense when we are working on the "fun stuff" and the dogs do seem to really enjoy it. I think there is a lesson in there (for me!) that in the end, everything I teach my dogs could probably be considered either work or a trick. It all depends on how I teach it.